Marjorie Kouns website is at http://www.marjoriekouns.com/index.html . For an explanation about this exhibit see http://www.thevillager.com/villager_96/forgetthegatesitstime.html . This article compares Kouns exhibit to the Cristo gates in Central Park. For photos of that exhibit, see https://pbase.com/hjsteed/central_park_gates . 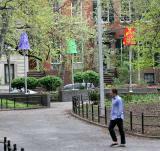 Hello Hubert: Marjorie Kouns here of Well-Lit Chess Pieces for Washington Square Park. Thank you! I am humbly honored to see my work documented as colorful and well composed palettes of pixels! Thanks for sharing your view with the internet community. I'd be very interested to know how I can obtain some of the images for my archives. Look forward to hearing from you. Again, many thanks for such beautiful pictures.